I hope all you Assassins Creed fans can appreciate this. It was inspired a lot by the official trailer to the game ( [link] ) I thought I should do something special for Ezio's last journey! You'll also notice a familiar face.. wait, he hasn't got a face.. 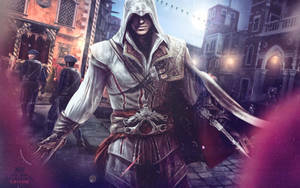 Anyway you'll see Altair in the background, he is part of Ezio's visions of his ancestor.. The suggester said: "This incredibly dynamic artwork just blew me away. You can almost hear the sounds of battle. And the tribute to Altair in the background is an awesome touch." Totally awesome! Damn Ezio looks angry! Another assasins in action, cool art work dude. I just noticed Altaïr in the background. Even in His old age, ezio was a beast in combat. The guard on the bottom left corner has the best death face ever, "DOH!" How on earth can somebody draw like this?! This is amazing! What a pity it is that I haven't found you and your art sooner. I love your drawing style. Loved this trailer. Justice done. these expressions are so well done! love your art! extremely awesome!! Wow, the movement in this is absolutely incredible! I'm so in love with these AC works you've got going on. and Altair in the background made my heart melt a little. Ezio was my favorite assassin, hope Arno is just as good. I've noticed a repeating pattern of lower jaws sticking out. Damn this is intense so badass. This is my favorite Assassins Creed Art on Deviant Art. I think this was my favorite game story-wise. The ending was kinda sad, but moving. Game play-wise, I don't know. Is it possible to have too many weapons? Either-or, your artwork is great! All this time and Templars still didn't learn not to mess up with gramps? And this is why I play Assassins Creed. Ah, I love the Altair part!